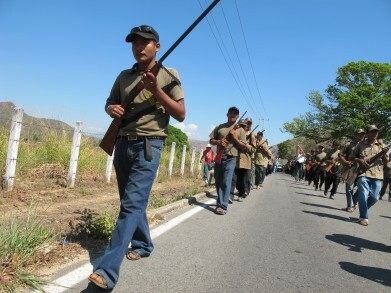 Indignant over the police and government’s inability or unwillingness to reduce violent drug-related crimes, citizens in Mexico’s rural, mostly indigenous, southwestern state of Guerrero have (once again) organized armed self-defense groups to ensure their own public safety and security. The spark that ignited the recent wave of dozens of communities to declare the formation of their own policing groups occurred on January 6, 2013 with the kidnapping of a local community leader in the municipality of Ayutla de los Libres, in the region known as the Costa Chica. Indignant over the police and government’s inability or unwillingness to reduce violent drug-related crimes, citizens in Mexico’s rural, mostly indigenous, southwestern state of Guerrero have (once again) organized armed self-defense groups to ensure their own public safety and security. Guerrero, which has some of the poorest regions in the country – concentrated mostly in rural indigenous communities, has seen a spike in drug related violence over the last several years with cartel-linked extortions, kidnappings, rapes and murders. The state assumed the not-so-prestigious number one spot of the highest murder rate in the country in 2012, outnumbering the murder rate of Chihuahua, which is home to the notoriously violent and embattled city of Juarez. It also tops the list of states with high impunity, with 90 percent of crimes going unsolved or simply not investigated by authorities. The spark that ignited the recent wave of dozens of communities to declare the formation of their own policing groups occurred on January 6, 2013 with the kidnapping of a local community leader in the municipality of Ayutla de los Libres, in the region known as the Costa Chica. Over 800 townspeople in Ayutla and another community, Tecoanapa, responded to the news by arming themselves with hunting rifles and machetes, adorning ski masks, setting up roadblocks and checkpoints, and detaining over 40 individuals who they claim were criminals or members of drug-cartels. Since then, more than 20 other citizen self-defense groups have formed in the region. “This movement arises from the need to prevent crime and to avoid deaths, and we seek to bring down and eradicate crime at its roots, which is poverty, and then restore the rights of citizens to recuperate their lost dignity,” stated Bruno Plácido in an interview with the EFE news agency. Plácido is one of the leaders of the Union of People and Organizations of Guerrero (UPOEG), the primary group responsible for organizing and promoting the recent boom of citizen self-defense groups throughout the region. The UPOEG came to light in 2010 as a citizens and indigenous rights group, taking up the cause of combating abusively high electricity costs from the state-owned Federal Electricity Commission (CFE), and promoting indigenous self-determination or “uses and customs”. Now the organization is recognized as a citizen police force. It may come as no surprise for some that the UPOEG has gone from fighting high utility costs to arming citizens and fighting organized crime. This is because Plácido and his brother Cirino Plácido – another leader of the organization, were active and long time members of an older and well-established indigenous self-defense group called the Regional Coordination of Communal Authorities – Community Police or CRAC. The CRAC, formed in 1995, has been constructing and expanding an innovative system of participatory justice and policing based on indigenous “uses and customs”. The more than 17-year-old project operates in more than 128 indigenous and mestiza communities of the Costa Chica and la Montaña regions, with thousands of volunteer members elected through community assemblies. This makes it a “public and collective justice system where many eyes evaluate those who have committed errors.” The project of the CRAC is to not only ensure safety and security for its communities, but to also promote indigenous autonomy and the protection of indigenous lands which are being contested by foreign mining companies for high value minerals such as gold and silver. The CRAC has distanced itself from the recent insurgence of self-defense groups organized by the UPOEG. It cites strong differences in tactics, the UPOEG’s relationship to the State Government, and the misleading and unauthorized claims made by UPOEG leaders that the CRAC was also behind the wave of self-defense groups. In a denouncement released days after the initial uprising, the CRAC underscored some of these key differences. It criticizes the UPOEG’s decision to conceal the identity of its members, implying that they are not elected by a broader community assembly, a contrast to the CRAC’s principles: “we are named by our assemblies, all of our people know us, which is why we don’t have any need to cover our faces.” The CRAC also criticized the UPOEG’s methods of searching for and detaining suspects without broader community participation and input, a method that some suggest as being a practice of paramilitary or vigilante groups. With the initial uprising the State Governor, Angel Aguirre Rivero, announced a decree that would incorporate all self-defense groups throughout the region into local and state law enforcement agencies, which have been plagued by charges of human rights abuses, corruption, and links to organized crime. The CRAC rejected the mandate and negotiations with the government, stating that its legitimacy came from its own communities and popular assemblies, rather than the government. “We don’t need recognition [by the state] because we are already legitimate; we are legitimate because our people elect us, our community police are legitimate because they are chosen through community assembly,” stated Pablo Guzman, one of the CRAC coordinators. The CRAC also bases its actions and legal legitimacy on indigenous rights to autonomy and self-determination guaranteed by the Mexican Constitution, Guerrero state law 701, and Convention 169 of the International Labor Organization. The UPOEG, however, has openly negotiated with the State and Federal government, seeking greater official recognition from government institutions and going as far as inviting legislators to see first hand how they operate. “We need our communities to agree to an intensive dialogue with the legislatures at the local and federal level so that we can have our system of security and justice in this region of Guerrero, recognized.” stated Plácido in an interview with the newspaper Milenio. There are strong speculations that the UPOEG is negotiating with the State government to receive financing, weapons, uniforms and reportedly over 500 radio and communications equipment to bolster their self-defense organization. In a meeting with the State governor on January 14, members of the UPOEG requested the assistance stating that it would be a way to “purify” their communities of corrupt or incompetent local police. In response to these speculations and the UPOEG’s dialogue with the state government, the CRAC issued a statement accusing the UPOEG of being co-opted and “bought” by State and Federal authorities who seek to divide indigenous communities and open up their territories to “install foreign mining companies.” The CRAC continued by saying that the activities and actions of the UPOEG have the characteristics of being a paramilitary group that will only generate more conflict and incite greater militarization of a region that has seen decades of armed conflict and violence. In the late 1960’s and early 1970’s Guerrero was the focal point of Mexico’s “Dirty War.” The then ruling Institutional Revolutionary Party (PRI) had sent over 24,000 elements of the army to permanently occupy the state to repress the insurgence of indigenous and peasant guerilla movements led by beloved school teacher turned revolutionary, Lucio Cabañas and also Genaro Vasquez Rojas. Later, in the 1990’s and 2000’s, leftist guerillas of the Popular Revolutionary Army (ERP) and the Revolutionary Army of the Insurgent People (ERPI), made their public appearance. The State’s tactics in its counterinsurgency campaign involved illegal detentions, torture, and over 500 reported cases of forced disappearances. Many residents of the region demand the withdrawal of the military occupation because of reported human rights abuses committed by the military. In 1998 Mexican soldiers massacred 11 people in a schoolhouse in the indigenous community of Charco near Aytula, in search of members of the ERPI. In 2010 the Inter-American Court of Human Rights declared the Mexican Government responsible for the rapes of indigenous women by soldiers. Dirty War tactics and human rights abuses continue in the state with the militarized Drug War strategy launched by former president Felipe Calderón. The climate of violence reigns with the military’s confrontations with powerful organized crime. The number of forced disappearances in Guerrero has nearly quadrupled since the dirty war of the 60’s and 70’s with over 2,000 cases reported since 2005, while according to Human Rights Watch, in Mexico “there have been more than 25,000 people who were ‘disappeared’ or reported missing since 2006.” It thus comes at no surprise that the wave of community self-defense and police groups have formed to exercise their own form of safety, security and justice. Although tension and distrust exists between the CRAC and UPOEG, both have agreed to reduce tensions so as to not further any more violence in the state.